When arthritis develops at a young age or is in the early stages a joint replacement is not always the most appropriate option. Once tissue, bone, ligaments and cartilage has been removed and replaced with artificial materials there is an inevitability of the materials wearing out and further surgery being required. This has lead to the development of joint preserving operations that aim to allow patients to avoid a joint replacement for as long as possible while maintaining a healthy and active lifestyle. 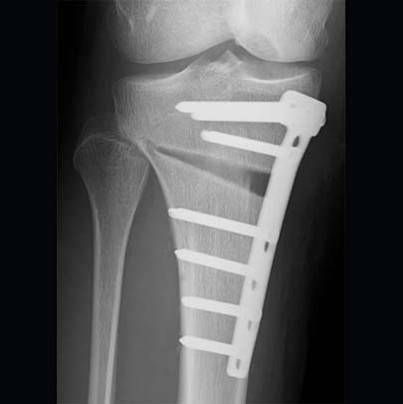 The main joint preserving techniques used by the Oswestry Orthopaedic s knee specialists are high tibial osteotomy, distal femoral osteotomy and cartilage regeneration procedures. This is the commonest osteotomy in our knee specialists practice and is appropriate for a patient with what is referred to as a ‘varus’ leg. This is often down to a combination of wearing on the inner side of the knee and possibly an underlying subtle bowing or ‘varus’ of the tibia which is a common finding in sporty men who have slightly bow legs. The majority of people suitable for this procedure are men. In the out-patient clinic your surgeon will order full length x-rays of your affected leg whilst you are standing. Using a computer software package he will then sit with you and work out where your ‘plumb line’ or ‘mechanical axis’ presently lies and calculate the angle of correction that would be required to improve your symptoms by moving the load away from the damaged part of your knee. Realignments of 10-20 degrees are appropriate for most people. The favoured surgical technique is presently the ‘opening wedge’. This requires a surgical break across the top of the shin bone stopping short of going all the way across. 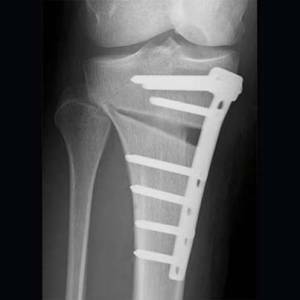 The leg is then carefully realigned using x-ray control and the new position secured with a specifically designed plate and screws. After HTO you will not usually require a knee brace or splint and you will never be in a plaster. You will be up and about with crutches, but not fully weight bearing for the first 6 weeks or so. If a check x-ray at 6 weeks looks satisfactory you will be encouraged to proceed to full weight bearing. Most patients are ready to return to work and even resume a little light training after 10-12 weeks. HTO does not address the underlying problem of wear in the knee, it works by re-distributing the weight across another part of the knee. Eventually further surgery will be required but it is not uncommon to experience relief of symptoms for 10 years or more with this technique. Distal femoral osteotomy (DFO) involves creating an angular correction of the ‘plumb line’ by performing a partial surgical break at the lower end of the thigh bone, just above the knee joint. This is a much less commonly performed procedure than HTO and once again, strict selection criteria have to be met. Commonly, patients who are suitable for DFO have an underlying problem with the developmental alignment of the end of the thigh bone, that lead to problems in later life. This condition is called ‘Lateral Femoral Condyle Hypoplasia’ and leads to a ‘knock-knee’ deformity on the affected side, also known as ‘Genu Valgum’ or a ‘valgus’ knee. Another group of patients who may benefit from DFO are those who have their lateral meniscus removed , often as a teenager. This can lead to premature wear of the outer side of the knee and development of a valgus deformity. Depending upon symptoms, activity levels and the severity of damage, such patients may be better served by a lateral unicompartmental arthroplasty. Your surgeon will discuss this with you as required. The DFO is a highly complex operation and requires careful planning, much like a HTO. Techniques and implants have improved greatly over the last decade. The 2 main options are lateral opening wedge (like the opening wedge HTO) and medial closing wedge. If your specialist feels the lateral opening wedge is the best option for you, supplementary bone graft from your pelvis (hip bone region) will be required. Like a HTO, a period of restricted weight bearing will be necessary to achieve satisfactory healing. Most patients are ready to return to work about 12 weeks after DFO.